Plants like hops and non-clumping bamboo reproduce asexually through root runners. As my garden bed for hops is to be shared with other crops, the roots need to be kept in check. 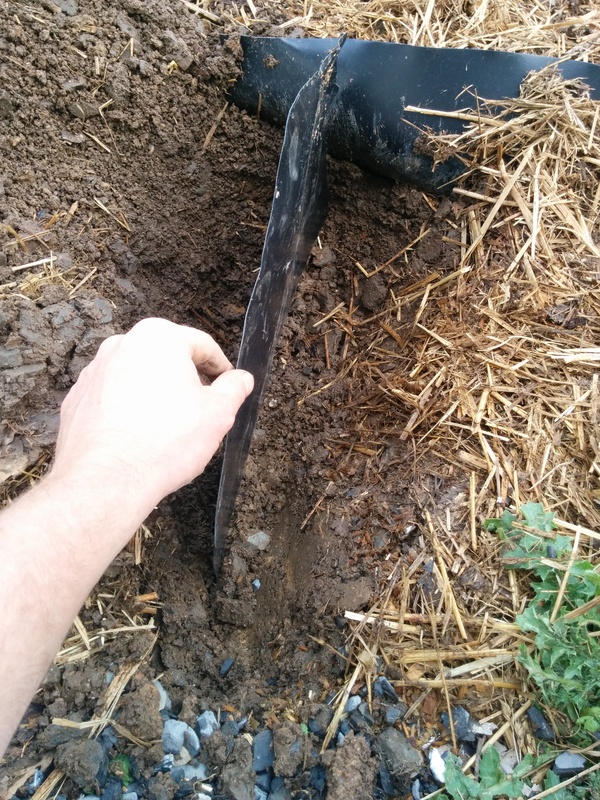 To prevent potential trauma to the hops from annual (at least) root pruning with a shovel, an impervious barrier is used to block root progress. I’m not thrilled to use a petroleum product in my garden, but I will make exceptions for plastics when used permanently rather than disposably. There is no way to sugar coat the grueling work that goes into installing root barriers. Only once for the life of the farm will I have to do this. At least that is what I told myself to get through it. 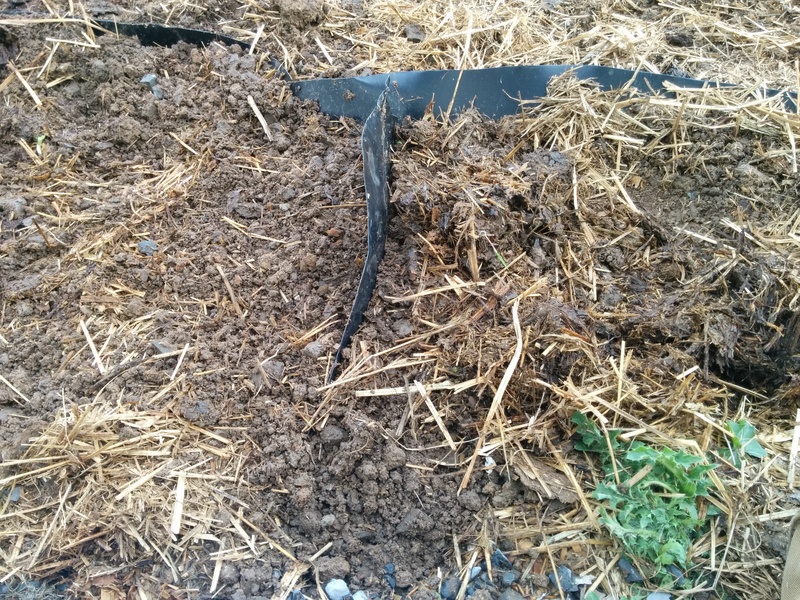 Luckily my strategy of building garden beds via “lasagna gardening” let the shovel cut smoothly through the previously graded and compacted fill dirt from the construction of the barn. It certainly wasn’t like a knife through warm butter, but it was workable. 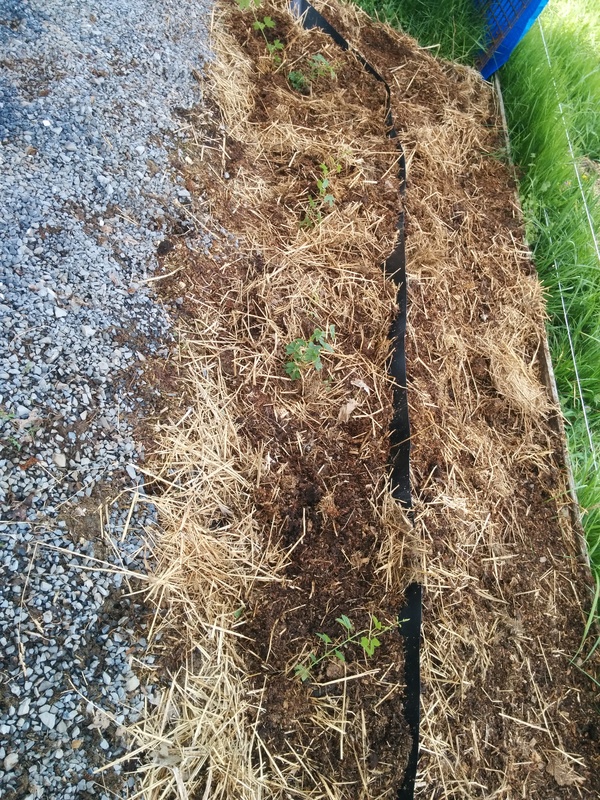 Lasagna gardening is laying down a barrier like cardboard or multiple layers of paper to kill turf and prevent weeds from growing. On top of this barrier, compost or compostable materials are layered. As a result, the smothered grasses and soil beneath the barrier becomes ideal invertebrate habitat so the worms, mites, springtails, etc. go to work digesting the now-dead grasses before moving onto the cardboard leaving the previously compacted soil below relatively well aerated. Only a few scraps of the original 80 foot x 4 foot cardboard laid in November persisted! Still, digging an 85 foot trench in the pouring rain was not fun! or you can rent a trencher but I was worried about compacting the surrounding soils with the machinery. A board to lay across the soil to spread the impact of your body weight and prevent soil compaction. 1. 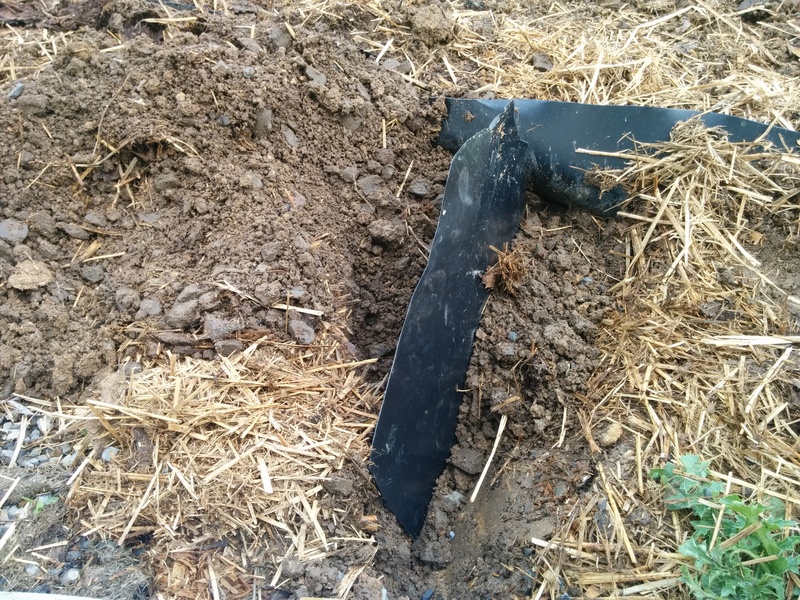 Dig a trench to the depth you deem adequate to contain the roots. In my case I want to inhibit the spread of roots. It will be easy to address the individuals if a few determined ones get under the barrier somehow. I neglected to get pictures of this part because it was absolutely pouring rain so I left my phone inside. 2. Anchor the root barrier material at one end of the trench (rock, cinder block, etc.) and unroll it to the required length. I found it easiest to rest the roll on top of one side of the trench, push it down the full length and insert the barrier into the trench later. 3. Cut the roll when the required length has been reached. Make sure it remained anchored at the opposite end! 4. Ensure the barrier is touching the bottom of the trench and backfill. Alternated the sides of the barrier that received each shovel full so the opposing forces of the dirt hold it upright. 5. Once the barrier is adequately installed, trim the top if necessary. I found that with good tin shears, I could start a cut then run them straight through the barrier without having use scissor action; like scissors through wrapping paper! Omitted step: the gardener’s eternal battle of clearing rocks from the soil while it is partially excavated. I saved the scrap I trimmed off of the top to install between sections of different hop varieties (seen in the pictures above). Honestly, I could not bring myself to discard 85 feet of the plastic trimmings so I will likely be looking for other uses of the scrap.